Still one of the greatest supercars ever made. The Audi R8 remains the consummate everyday supercar. It looks sharp, boasts a sweet V10 under the hood, has bags of grip courtesy of the Quattro AWD system and is totally compliant on the road. Perhaps the only criticism of the four-ring range-topper is that it’s too common. That’s where the likes of German tuning house fostla.de comes into play. 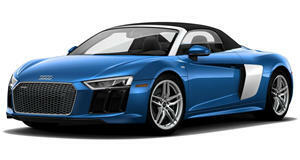 The Hannover-based vinyl wrapping specialist has just revealed its latest project, based on the Audi R8 V10 Spyder. The drop-top supercar received a gold-chrome-matte wrap with bright black highlights, as well as tinted headlights, taillights and windows. A PP-Performance power upgrade sees the V10 upped from 517 to 611 horsepower. In line with the boost in power, the R8 has been fitted with a remote-controlled throttle valve to give it a more raucous sounding exhaust note. Rounding off the modifications is a KW lowered suspension and a set of powder-coated gloss-black alloy wheels. The upgrade package has been priced at 15,000 Euros.